I hadn't heard of this film before reading your post. 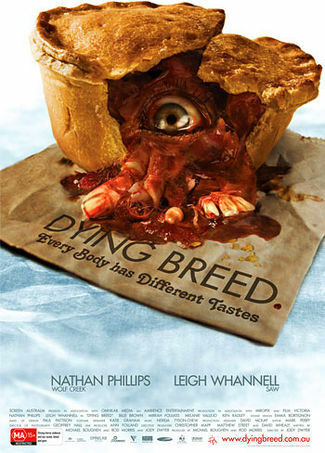 That poster immediately brought to mind Mrs. Lovett's meat pies from Sweeney Todd. At this Dying Breed was enjoyable! Some horror films can be so bad that they're good, but I've browsed through lots of horror flicks on Netflix were so bad that they weren't even enjoyable. Zed: Ha! You're absolutely right. I can definitely see the connection with SWEENEY TODD (even the poster art suggests that). And I thank you for trusting me enough to check out the movie! Much appreciated!